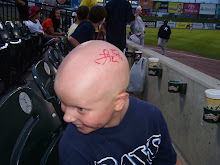 Autographs 4 Alopecia: Game 34: Happy Birthday Isaac! After batting practice we went to Bull's BBQ to get something to eat. Greg Luzinski is always there signing autographs, so I knew to take a few cards. I got 2 signed (1 for Gavin) and also had an extra card for Isaac to get signed. 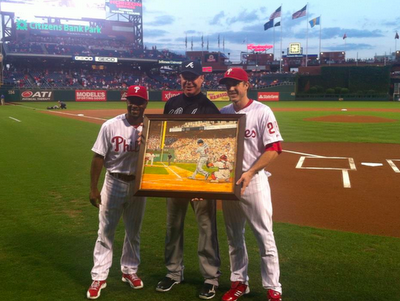 This would be the Braves last visit to Philly this year, so I was excited to see Chipper Jones play one more time. Before the game, Jimmy Rollins and Chase Utley came out and presented Chipper with a painting of him playing at Citizens Bank Park. We had great seats for the game and had a great view of all of the Phillies home runs. The coolest part was when Ryan Howard and Carlos Ruiz went back to back! Kyle Kendrick pitched a great game and the Phillies won 6-2! At that point they still had a shot at the post season but went on to lose Saturday and Sunday...blowing their chances. Howard and Ruiz hit back to back home runs! All in all it was a great night with Isaac, Pastor Eric, and my dad watching Phillies baseball! 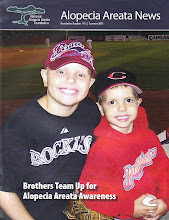 Thanks for letting me share in your special day Isaac! Happy Birthday Isaac on the big screen!